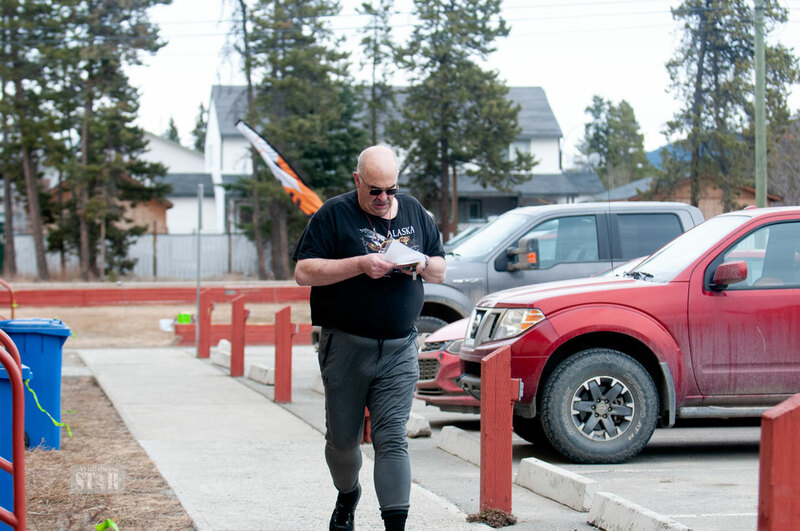 GETTING HIS BEARINGS – Craig Brooks checks his map shortly after starting the Yukon Orienteering Association’s inaugural Coast Mountain Sports Sprint Series on Thursday starting at Takhini Elementary. The Yukon Orienteering Association had the first event of their season, the inaugural Coast Mountain Sports Sprint Series on Thursday. The competitors started at Takhini Elementary. There were two loops that are run in a different order by each runner, though the overall distance is the same. Erik Blake said the sprint series was modelled after a series he would participate in while living in Norway and that the Yukon Orienteering Association decided to give it a try this year. Blake said it worked well and there were lots of smiles at the end, despite the chilly, overcast weather at the start of the race. He also said because it just one course it is easy to set up. The race had 11 controls for the athletes, who carry a stick or an RFID tag, to check into. The tag records the racers time and is proof that they were at the control. Blake said the only requirement is what order the racers do the controls in. There will be four other races in the sprint series. Blake said typically sprint races happen in an urban setting while the other two formats, middle and long distances, take place in the woods and have more than one course based on skill level. The racers will accumulate points towards their final score after the five races. The best four out of the five races will be used to calculate the runner’s overall scores. In the 12 and under category Stian Langbakk was the quickest to reach the controls, finishing the course in 31:24. Colin Abbott was the fastest in the M21E category and was followed by Caelan McLean and Matthias Purdon. Dahria Beatty was the first to all the controls in the F21E class. Pia Blake and Jennifer MacKeigan were the second and third to complete the course. Forest Pearson was the top Male 35 runner to reach the controls. Brent Langbakk and Benoit Turcotte came second and third. The Female 35 plus category was taken by Virginia Sarrazin. Rima Khouri and Lara Melnik. The over 55 categories were won by Afan Jones and Barbara Scheck. Bob Sagar and Craig Brooks were second and third on the men’s side. Deb Kiemele came in behind Scheck. Sherri & Lenore M&H were the top team. Charlotte & A. Cheetas and Oliver & Coco Coconut and Olives rounded out the top. Thirty-nine runners took part in the premier sprint race. The next race in the series will be run on April 25.